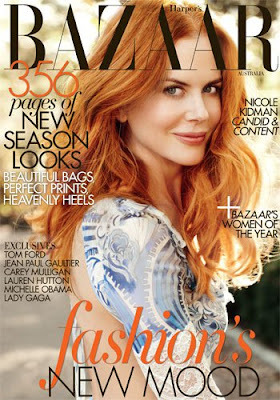 Nicole Kidman is looking fabulous on the March cover of Harper's Bazaar Australia shot by Alexi Lubomirski. American readers might be seeing double however as the cover shot was taken from Kidman's spread in her February Harper's Bazaar USA issue. I must say though Australian Harpers has made a great cover, unlike its American counterpart. The cover welcomes Autumn gracefully, love love love. Click the link below to see shots from Kidman's USA spread which will undoubtedly feature in the Australian issue.